Do you work for Box? Learning about Box? We can help. "File Sharing is easy and convenient"
"I am amazed at his perfection"
"Safe and fast storage with Box"
Box is the program that we use in our work team to send documents to our employees, customers and we even ask for resumes that are hosted in Box for faster viewing or downloading. It is an excellent program, one of the best in its class, it has also been great to use it to make backup copies when we have run out of space in physical storage disks. At the moment the only thing we do not like is the little storage space they offer in their free plan, as we believe that this can be improved because other third-party programs offer much more. We have also found a problem when editing simultaneously, because when one of the editors wants to save the changes they may not be saved correctly. If you want to store files, multimedia content, documents, make backup copies, work as a team, synchronize files from your mobile or computer, Box is the program that we can recommend you use. Box has helped us a lot to do team work when we are not in the same place, it is very easy to synchronize and upload the files or documents from our computer to the cloud. We have also worked comfortably with the mobile application, something that we think is very good because it is not mandatory that we are on the computer to view the documents. For us Box is a great program. "Box allows me to keep my important documents organized and share them"
"Store secure in the cloud and fast with Box"
Box is a great tool that allows us to share files and documents which is the main reason why we use it, in our work team we have to send documents and files constantly and Box allows us to do it online. It is very easy to use, we just have to upload a file to the cloud and then with a link we can share the access, the visualization and the download of it. So far we can mention that we do not like your weight limit to share multimedia files, we believe that something that can be improved and even more in payment plans, also the limit of storage space for free accounts, since there are other third-party programs that can offer much more. If you do not have more space, you want to work remotely, you need to send a document to someone far away or you need to make backup copies, BOX is the program that we are going to recommend you to use. If you need to share files, images, videos and documents with your team and are not in the same place or you are not sitting in the browser, Box is the program that can help you uploading your files to the cloud from mobile or browser and sharing and providing access through a link! In this way, our company has benefited, we save time and space in tangible discs and the synchronization in any place and device is very good and fast. "All content in one place"
"Safe and reliable storage with this excellent tool." I like Box, since it has allowed us to work in an organized way, being able to share the files with the work team and even with our own clients is undoubtedly the great advantage of using this incredible application, saving time is significant. Box has a very intuitive platform, which makes its use is not complex. Storing work files has never been so reliable and secure with Box. Box has proven to be a very useful tool and with which we have obtained great benefits, we have not found anything that we do not like, on the contrary, it is an easy tool to use and has fully complied with our expectations and basic function, we will follow it using, it's excellent. To maximize the processes saving a lot of time, efficiency, organization, better management of information, Box is the best alternative to store information without risk of loss of it, to share it and keep it updated allowing significantly improve response times . That is why I highly recommend this valuable tool, do not lose more money buying external units whose risks of loss of information are very high. Box we use it daily. Box has been a great support in the execution of our tasks, it has impacted in a positive way, for the benefit of the organization, since it has allowed us to save time and work in a more organized way. As a sales representative, I also use this tool to share information with my clients, I manage a fairly large client portfolio, so I need to take folders organized by clients, this has allowed me to execute tasks quickly and efficiently. In turn, communication with the work team has been quite fluid. We continue to use it for its extensive collaboration and great benefits. Wonderful tool. "Secure tool for the storage of work files. " I like Box since I can store my files safely and share it with my team at any time and anywhere, since I can connect from any computer. Box is the most useful way to store our work files, since it facilitates the work, it is a tool that offers free version and it is really enough. It has an intuitive platform and easy design, which makes it easy to handle without any complexity, it is very good and we use it every day. So far, box has met our expectations and that is why we keep using it, I have not found anything that I do not like, it has been very helpful and useful. The capacity in its free version has not been a problem for us, there is fluidity of information, we like it a lot and that is why one of our main work tools gives us security in the storage of the files with which we work daily. For its great utility and security for the storage of files, for the flexibility and ease of use, for the time and money saving that process and how functional and useful it is, I recommend this great tool, store your files online I had been as safe as it is with box. Among the great benefits obtained with box I can say that thanks to this powerful tool we work in a much more organized way, by sharing the information in a timely manner with our work team makes it fluency and saving time is incredible. We feel safe with the box since the information is safe, we also save money, since we do not buy external storage units and they are unsafe. Box is the easy way to bring a better organization of our files, give much faster answers, be more efficient, as well as meet faster with the established goals. It is very useful and we will continue to use it as our main online storage tool. "good tool for backup of files in the cloud"
Box is a tool that I like because in addition to offering different versions according to the needs of the user, it offers the option of implementing it for free for a limited time but allowed me in certain times to back important information in a safe way without having to go to emails , so I consider it a nice software for loading and accessing documents. Is a good tool with great benefits and opportunities both individually and as a team, however I consider that a limiting aspect for its use is that it has versions that limit the loading and storage of files, which would be better if the selected plan is it was unlimited. I recommend it because it is a tool that provides free access online, for small businesses it is a good option for the backup of files and documents of utmost importance keeping them organized in folders, also allows to store any type of file and access it easily at any time and place from our computers, phones or tablets. This tool gave me the opportunity to protect documents of great personal and work importance, giving me the benefit that the previous versions of the documents could be saved automatically, it is an excellent option to access the files at any time. undoubtedly I think it helps to eliminate anonymity as to who sees, downloads and edits the shared documents as it allows to know who is accessing them. What I like most is that I can store all kinds of files and in relatively large sizes, because now the storage capacity has improved, I also have access to my files from any device. I can organize all my work by folders and I am very happy with the security that this tool gives me. It also has a free version, which although limited, has many benefits. I have used it for a couple of years and I have no complaints that affect the performance of this storage. Although it is an excellent tool for storing jobs, its capacity is limited and if you want more storage space in the cloud, you must pay for it. Another thing I do not like is the inability to access my files when I do not have access to the internet. As an auxiliary tool I highly recommend it, it is organized, with a good degree of security and you do not need to invest money to obtain it, unless you want to expand your storage spaces. It is also very good to share files with other people who use the same tool. As an independent accountant I need enough storage space to store my work, and not only that, but to have the option to share information with my clients at any time. This tool is very good in that aspect and so far I have not reported any extra expense. The watermark in the documents has been very useful for us to be plagiarized or another person to benefit from the work done by me. "With Box I manage and store my files securely from anywhere"
"Make backup copies and store in the cloud with Box"
Box allows our company to work in a more comfortable, fast, organized and as a team. We can easily store in the cloud and access our files from the browser or mobile application, it is also very easy to provide access to files or documents sharing a link and then the person who receives it can view the document before downloading it, without a doubt It is a very good advantage. At the moment we are good with Box, we can only mention that sometimes the time of the session expires very fast or it seems that it does not detect our session and closes it and we log in again. But negative aspect as such of the program we have none, it has been excellent to use it for us at this time. Box has benefited us in the sharing and storage of files, both personal and work. It saves us time in synchronizing files in both your web application and your mobile. No matter where the person with whom we want to share a document is located, either in the same country or another, with a link you can access the information that we want to provide. "Magnificent tool to safely store our files! " I like box because it allows me in a very simple but secure way, to store files or documents, which I can access or have at any time and in turn, to share them with the people in my work team, external personnel and up to clients. It is a quick way to access documents without loss of time and allowing the flow of information. So far I have not found anything that I do not like box, on the contrary, it has brought great benefits and that is why it is our main storage tool for the information we manage daily and which in turn we can share reliably . Box is a very useful and functional tool, with very low cost plans and also has a free version, for the security it offers, for the simple and practical interface, and for the great benefits it has brought us, I recommend its use, saving The time you will get in your day to day work will be quite significant. Start using it now. The use of box as our information storage tool has had a positive impact on the organization, since it has allowed us to have a better planning of the tasks motivated by the great saving of time that has generated us, since when storing the information Online, the search has been made easier and by allowing it to be shared with other people, the work has been made even more agile. Box has allowed me to take sales management in a more organized way, since I manage folders by clients and at the same time I grant access to whoever allows it. The efficiency obtained with box is reflected in the organizational results, improving the quality in the provision of services, thanks to Box. The capacity of storage is unlimited, which fills me with calmness because I do not have to worry about filling up the storage and having to delete files that I may be using later. "Use Box to work with your team in the cloud"
Box is an excellent program for team, personal and business work. If you have to share a document or file with your work team or a client, we recommend you do it Box, upload your file to the cloud and with a link you can provide access to download, and you can even view it before starting the download. It is easy to use, with clean and beautiful design, you can access your account from the browser or mobile application. From Box we can mention that we do not like some of its limitations for both free plans and payments. For free plans we can only upload files of up to 250 MB and for payment plans between 2 GB to 5 GB, we believe that for free plans the size should be increased and for unlimited payment plans. The rest is a very good program to store and work in the cloud. We recommend you use Box since it is a very good program, easy to use for personal or business things, whether you are a large or small company you can use Box with your work team or with your clients to share documents, do not think twice and use it! Box has allowed us to work in a more comfortable way, no matter where we are whenever we have an Internet connection we can access our cloud and work or share the files. This has allowed us to save quality time at work that we can invest in other activities. "Good program to share files and store in the cloud"
Box is a good program to share files and documents with our team and even for personal use. It is very easy to use, has a good design, simple and modern. We can easily access from our browser or mobile application. The only thing we do not like, is that sometimes it can present failures in the synchronization of documents if they are published simultaneously or in parallel from the browser and web application. But everything else is a good program to store in the cloud. Box is a great program to store in the cloud, to do team work and to share files with people you do not have close to you. Whether for your work or company, Box is a program that we can recommend for storage in the cloud. Box allows us to share documents, files, guide and video tutorials with our clients or internally with our team. The upload and download of files load very fast and are easy to share and provide access. In addition, it also allows us to make backup copies in the cloud in case we run out of enough space in the computer or mobile phone (this also works for personal use). "Magnificent tool for safe and fast storage! " To be able to share the files quickly with my team, without wasting time and no matter where I am. The simplicity with which Box works allows me to develop quickly and in a timely manner, without the risk of losing information. Box is designed so that any user can access without greater complexity, adding value to our performance in the organization, playing a very important role. It's excellent. Being a friendly and simple platform makes it one of my usual and favorite tools of my day to day work, whenever I require any information or document there is this box to obtain it. So far, box has been perfectly adjusted to my needs, I have nothing bad to say about it or that I did not like, it is really good and effective. The security that box offers me in the support of my information is more than enough to recommend it, we handle a lot of information and with box we can have our files organized, dispose of them without major setbacks, it is a very good tool, use box as Main storage tool and say goodbye to external units that take time. Undoubtedly the efficiency and speed with which we have managed to perform the tasks in the organization, has allowed us to progress progressively and consecutively with the rest of the tasks in the area. How to develop web, I must attend several departments in the organization, so box allows me to organize and manage folders for each and in turn share it with those people executing my work in a timely and accurate way saving a lot of time. For its great benefits we have obtained, we use box as the main online storage tool. "Powerful tool for safe and fast storage! " What I like most about this incredible application, is that no matter where I find myself, I have the files I need and in turn to share them quickly and safely, in turn I can access from any computer and for free. It is a simple tool, very useful and we can trust to store any file, create folders by team and I can establish who can access them. It's really good. So far, with box I have been super good, is a tool that works super fast and has not presented any inconvenience through use, therefore, there is nothing that I do not like box, it is a great system of cloud storage. For the security it offers around the non-existent risks of information loss, for the simplicity, for the practical, the low cost, and the great benefits offered by this great tool such as box, I recommend its use, I have nothing else What to say, start now with box. The execution of daily tasks is done in a more organized and fast, that is the greatest benefit we have obtained with box, it is worth noting that, despite its limited capacity offered in its free version, has fully complied with its specific purposes, that has allowed us to achieve greater fluidity of information in the work team to be able to share the files online. With box in turn, we feel safe and confident as there is no risk of loss of information. Regarding the sales area, the sector in which I work, I have taken better control and order with the clients, since by sharing the price lists, promotions, through the use of box, it saves me a lot of time necessary to carry out other functions also indispensable within the organization. I have the performance of each user in each task that is done as a follow-up to each document and I know who shares or edits the original file. Everything is very simple to make. I love how well organized everything is and that I can access Box right from File Explorer. As well, I appreciate how easy it is to share vital files with outside customers and companies without having to go through hoops. I dislike that when you're using the Web version, it's not as easy to view files and previews. When you click into a file, a side bar pops up that, while it contains helpful info, there's no way to minimize and can be distracting. This tool is really great for those with workers in different locations (either due to multiple locations or remote) and if you work closely with outside companies (agencies, customers, etc). If it wasn't for Box, we would have no way to share files both internally and externally. As well, we like how easily this cloud-based service integrates into our work computers so that uploading and downloading files isn't a hassle anymore. "Bet place to store our files and folders on cloud and that too securely"
The best thing about this box is the updates they provide. Everytime when I see an update, it really helps and we the whole team is very happy to see the things up and ready everytime. Also, the clean management dashboard gives us an addition benefit of making all the things at one place!! I only dislike the support. I have contacted 3-4 times but they have not contacted me atleast once. The whole team will recommend it to all the companies who work on the files and folders frequently and want to work collaboratively. 5 star from me and my team. With box, I and my team is managing all the documents and files virtually and that too with properly managed systems. Anyone can access from anywhere and anytime. No need to worry about forgetting the files and folders at the place. The benefit is that we the whole team can collaborately work on the single doc with no time wasted! "Safe storage with box! " What I like about having this application is that it allows me to have the files I need at any time and place no matter where I am, since I can open the application from any PC, and compile them with people from my work team. Easy to use, I can store any file. It's really nice. So far I have nothing negative or that I find disgusted by the use of Box, on the contrary, it is a very functional tool and accelerates the search for information more quickly and safely, it is a tremendous storage tool for any document. 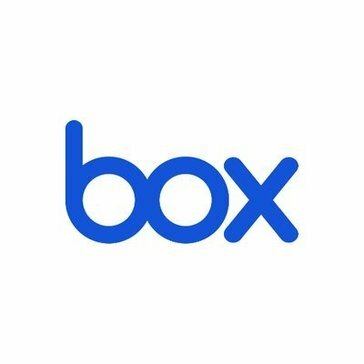 Because of its simplicity of use, for the security and confidence that this great tool of storage in the cloud offers, and for the great benefits it offers through its use, start using box, do not waste time or money in other similar applications. I consider it an application that provides functionality and has facilitated daily tasks in my work, the search for information to share is much faster, box is one of the best storage alternatives in the cloud because it promotes efficiency and offers better results to the end of the day, it is really a powerful tool for storage in the cloud. "With Box keep your information secure online. " What I like most about these applications that allows uploading all types of images, videos and audio of any format to the web, thus helping me a lot in the work, since the files that I upload can be updated and instantly users can view the shared content. I also like it a lot because I can not only share files in public, but I can also share or send them privately as in a group of files. What I like about this application is that through box we can publish work or someone specific. What I do not like is that there are some types of files that can not be viewed if they are not downloaded. In the end they have some details to fix, but otherwise it seems a very good application to be able to work. Because I would recommend it: I would recommend this application because it is very good to work, since it allows us to publish works publicly or privately, I recommend it also because the published works can be updated without needing to delete it. For my work as an administrator this application is very useful for me and that is why I recommend it with great confidence. What helps my company: In my company helps a lot because through this application you can work more easily either present at work or at home, since you can send all kinds of digital work through private messages or specific groups made by the company. What benefits me: This application benefits me a lot on my administration side because I can do my work in a digital way and thus publishing it or sending it to groups where my colleagues are working so they can see and be able to express my ideas and thus be able to have meetings of virtual works in a socialized way. "Box is a great storage software"
I really like how easy box is to use and it has more than enough space for all my files. I really like how I can have Box sync set up on my computer and it makes it really easy to sync files onto it without the hassel of having to login to the internet every time. I also really like how it is available on phones and tablets as well so I can carry all of my files with me everywhere I go. "Work as a team and store in the cloud with Box"
Box has allowed us to work comfortably from anywhere and only having an internet connection and the application or the program to access our documents in the cloud. It is a beautiful program in view, modern and easy to use. It is perfect for teamwork, whether personal, independent or in a company. You can from your free version, to a paid version if you need more space or use other tools for your company. Box gives you very good benefits or features that really do not make you think of anything negative about it, but we can mention a disadvantage that presents differences from other third-party programs and is the little free storage it offers, since there are other companies that They offer much more. We recommend that you use Box to work comfortably in the cloud either individually or with your work team, you will have quick access to your files or documents stored in the cloud either with the program or the mobile application, it will also be very useful for Share files between you or your clients. Thanks to this program our team has been able to improve in terms of time, speed, efficiency, since we have quick access to our files in the cloud, backup copies that we usually do from time to time and the files that we need to send to our customers. Just by sharing an access link or obtaining permission to view or edit, Box makes life easier for us in our work. In addition we can make easy and simple integrations with other programs. "Superb Cloud Based Storage and Management"
Having utilized other services similar to Box, I must admit that Box certainly receives a spot on my top 3 list of services to use for cloud-based file storage. As Box is an intricate part of our organization, it presents with a clean user-interface, easy accessibility, streamlined file management and intuitive capabilities that allow ease-of-use and expedites methods of adding collaborators and sharing documents securely. 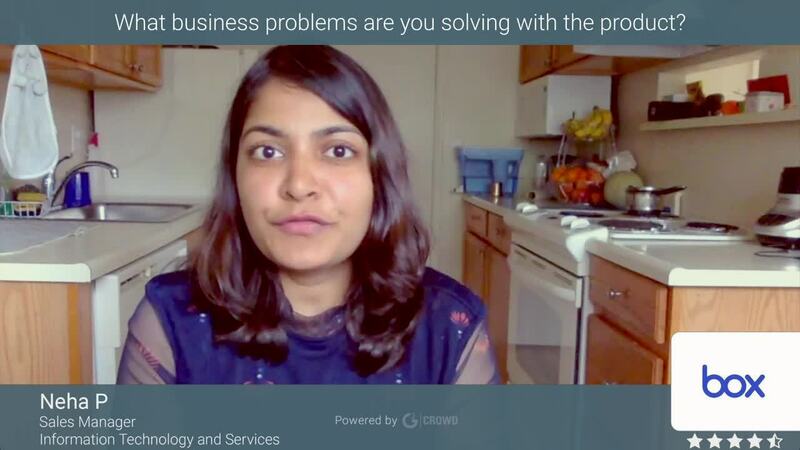 It's difficult to come up with rationale as to the disadvantages of using Box, however; the services that Box offers are versatile and presents its users and collaborators with an incredibly easy means of securely sharing data and limiting files and folders viewability. Therefore, I'm unable to speak to any disadvantages of using Box. Box offers an incredible service with a companion mobile application for easy access on-the-go. I would recommend this service to any business with an intent on securing safe online file storage and management. We provide our Clients with secure access to all of their financial statements, tax documents, and all business operations. All of our Clients have access and utilize this service and it is a cornerstone for how we conduct business in our industry. "Everything You Need In One Place!" I like that I can share all my documents with my coworkers and also start new Powerpoint, Excel, and Word documents on Box and have others collaborate. Box adds extra privacy settings to make sure things are as private as possible. It makes it simple to go back and find the things you need simply by typing in keywords. You can surf through thousands of files in a matter of seconds. It's hard to access it when it comes to having a fluid workflow. If I am working on a file I have to manually upload it every time I am working on something. It can be disruptive unlike you clicking "Save" and its housed in your desktop. I also think there can be some room for updates to the organization of the folders in Box. I feel sometimes things get lost within because of the lack of spacing and organization of time, title, or file size. Box is simple and accessible. It is best for big organizations. Privacy was a big issue for our institution and moving to Box creating extra protection to files consisting of student confidential information. Also, solves the problem of losing your work in Google drive or needing to log in another type of email to access the documents. We used to use a "shared" drive through servers though, the problem was we could not access files unless we were at work, which made working remotely extremely difficult. By shifting to Box people are able to access their files wherever they are. "Share ideas at any time"
"Reliability and file security with this powerful tool for storage in the cloud! " The best thing of this application is that it allows me to share files from my computer and from any place where I am with the people of my work team and establish permissions on who can have access, providing security and confidence in its use with just one click accessing the tool when required, easy to use and intuitive. It is a tool that offers great benefits and offers a free version, that is the best of all. Perhaps the disadvantage of this tool is the low storage capacity it offers, but, nevertheless, for the great benefits that I have obtained with this powerful tool, it does not represent a big problem, since it has helped me incredibly to the fluidity of the information, It is really useful. Use Box to manage your files or documents reliably, it's fast and it's quite functional, looking for another similar storage tool is waste of time. Start using it now, and get the most out of Box. I have become more efficient and faster in my work, since I get the information that I need so quickly accessing my account from anywhere, ensuring the flow of information, and facilitating the update of them, so, at the end of the day, I have updated information in real time, this has also saved me a lot of time, being able to do my other tasks and be able to manage time correctly and effectively. "A good cloud file storage service"
Box is a tool to store our files in the cloud efficiently and quickly. What impressed me most was the loading speed of the files. In less than 1 minute save almost 1 GB of information, far above other services. It offers in its free version 5 GB of storage, a very tractive quantity but that does not allow to use all the characteristics of the service. Box is mainly aimed at the storage of business files, so the paid version offers better features and the ability to take advantage of all its features. With the paid version we have the possibility to work the files in collaboration with an unlimited number of members of the team, as well as to increase almost unlimited storage capacities. For being a service with great benefits for business use due to the great features in its paid version, we are going to increase the level of service in order to be able to do collaborative work among the members of my team. Even in its free version it offers a great performance and a surprising speed of loading files and we have been able to store a large amount of documents in a very short time. "Convenient way of file sharing and collaborating"
Box is a great solution for sharing and editing documents among team members. The best side of Box is compatibility with office documents which increases productivity and saves our time while working with office documents. I can create any office document inside Box app very easily. Especially mobile version of Box is very handy when I am travelling. I can create, share or add collaborators to existing document in a seconds no matter where I am. In similar platforms you need to install additional software in order to view or edit office documents. But with Box there is no need for such softwares. The only drawback of Box is internet connection requirement for viewing documents which I already uploaded to the Box cloud. Sometimes I delete original documents from my phone and keep them in Box cloud. But if there is no internet connection I can't preview or edit such documents. "Save for offline" feature of Box is a great solution for this problem, but after using this feature my phone memory gets full. After using Box we managed to share our ideas more faster and easily. Productivity and creativity also increased while editing any kind of document. Box provided us flexibility and convenience while editing or sharing documents. "Box the best place to store"
Box is a very good platform to upload, save and share files, documents, photos and videos. It is excellent for backing up in the cloud if you do not have a physical storage device. You can easily and quickly share any file or document that you have in Box with just sharing a link or allowing access to specific users. This program honestly does not have big problems, I can only mention that when editing a document, if several people edit it at the same time a conflict can be generated and it may be that when saving the edition it is not finished or only doing it in parts thus losing a bit of information from one of the editors. I recommend using Box if you need to keep your files and work documents stored in the cloud and have access anywhere, also for personal use and especially if you want to share them in a quick and easy way. And in case you have a small or large company, you can implement this tool in the CRM of your company and your employees can upload and share the information they need to use. It is very beneficial to use this program to share files or your resume for example, in my case I use it mainly for that reason, I have a page where our projects, works, designs and especially my resume through a link of Download from Box. It has also been essential to be able to share the files of the work I have done. The best thing is that I can connect from the main page or using your application on my mobile something that allows me to be up to date with my work anytime, anywhere.